Picture Hanging Cord or Picture Hanging Wire? Picture Hanging Cord or Picture Hanging Wire? That is the question. A lot of people assume that picture hanging wire is stronger than picture hanging cord. This can be a false assumption. Many polyester low stretch quality picture cords can be a much more robust solution than some picture wires. Even with the maximum recommended loads for the cords, it is always safer to give yourself a larger margin for error and switch up to the cord size above what you think you will need. The cord of course will only be as secure as the quality of the knot that is tied coupled with the robustness of the picture hook and hanger that the cord is attached to. Polyester low stretch picture cord will approximately stretch only about 12% as opposed to 26% or more for for cheaper alternatives. This should ensure that you never see your picture hook being exposed due to cord stretching with load. Stainless Steel Picture Hanging Wire is the alternative to picture cord. It will not corrode, is of excellent quality and will shape and wrap easily. Similarly to cord it will still require a good knot tying technique. 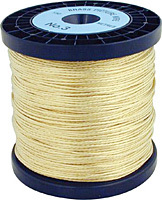 Brass picture hanging wire has brass strands wrapped around a strand of steel. Wires are specified by a Maximum Picture Weight and this should be treated with a margin for error. Ideally you should pick a picture wire that is double the weight specification of your picture. Whether you choose picture hanging cord or picture hanging wire to hang your picture, you will need to choose based on load criteria, ability to securely tie to fixings and personal choice as to what you think works best for you. Alternative solutions to picture hanging cords and picture hanging wires are to use picture frame hangers to hang directly onto picture frame wall hooks. This can be achieved by using some of the heavy duty wall hooks and heavy duty picture angers. This solution however requires precision positioning to ensure a level hanging picture. This entry was posted in picture cords and picture wires, picture framing information and tagged picture cords, picture hanging, picture wires. Bookmark the permalink.